The game is consist of 5 stages with 5 different species. The species are facing death in their own habitats caused by climate change. To save them, you have to hold them and follow paths to move them to better environments. There is no enough time for the species, you have to move them fast before their energy runs out. Where do the species go in the end? Can they all find better habitats? You can try out assisted migration and save species in the adjacent game! As the climate changes, rare species should disperse to more favorable environments. This is not always possible, the help of humans is sometimes needed. The first demo of game in Aalto Design Factory. The concept is focused on a specific research method called Assisted Migration which is to help species move where they can thrive when the climate has changed and they can not get there by themselves. The goal of the game is moving endangered species to good habitats. When people walk into the game area, an endangered animal appears on the floor. To move the animal, people should surround the animal by holding their hands. Basically they can carry the animal by blocking it. Once they capture the animal, they should move toward good habitats all together without missing hands. The game is to give indirect experience of helping the endangered animals to the audience. By doing so, it can encourage people to know about the issue caused by the climate change. 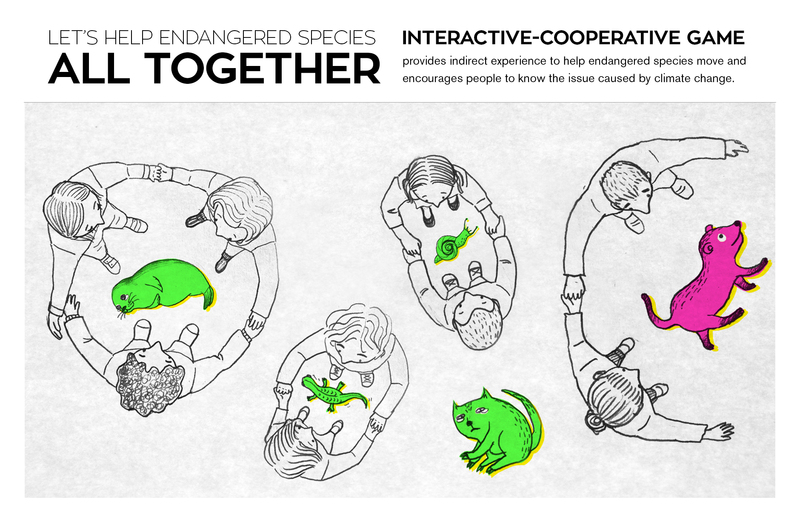 Also, the requirement of collaboration would let people experience that more than one’s effort is needed to actually help those endangered species. The project is for the coming exhibition of The Finnish Museum of Natural History(LUOMUS) under the main theme of climate change. The museum asked for an idea which enables the audience to experience what endangered species are going through and how new research methods can help the species for both educational and entertaining purposes. is pursued, thus the use of various different media is encouraged. At the same time, the project must be practical, durable and affordable. The project is arranged by a course, Production Clinic, of Media Lab Helsinki.